The first few years of my federal career in the 1980's were spent at NASA headquarters working for the Business Management Division of the newly initiated Space Station office. During those early “design phase” days, I looked forward to the future when the Space Station would actually be up in orbit, with astronauts on board carrying out interesting science experiments in zero gravity. Little did I know that three decades later I would be a Peace Corps Volunteer on a tropical island, watching the Space Station go over my head, along with about 15 screaming children from my village. I think you can sense the excitement in these 14 youngsters! It had been a good week for astronomical events in my village. Sunday night was a beautiful lunar eclipse, Monday night had a big, bright, nearly full moon, and Tuesday night was the first time since my arrival that the Space Station—now large enough to be the second brightest object in the night sky (after the moon, of course)—passed over top of Dominica. There have been a few passes overhead in the early morning hours, but I was waiting for an evening transit to invite my students to watch with me. Plus, I told many of the village residents to watch for it as well. It turned out to be a memorable event for all who saw it! Anyone can go to NASA's website and sign up to receive email notifications when the Space Station will be passing over your location. I often used the site back in West Virginia to watch the Space Station go by. After my arrival on Dominica, I was pleased to find out that this NASA service was not just limited to locations in the U.S., but also has many international locations. The only city listed for Dominica was the capital, Roseau, but I figured my village was close enough so that both the timing and directional information that NASA provides would be close enough. I announced at school that I would be down at the playing field that night to see the space station, and anyone who wanted to join me would be welcome. The station was scheduled to pass overhead between 6:51 and 6:55 p.m. Some students said they would watch from their own homes, but others said they would join me. As it grew darker, youngsters began joining me at the playing field next to our little primary school (which has a total enrollment of 30 students). At first, we counted stars as they appeared, and talked about the Space Station and what they could expect (“No, the astronauts will not be able to look down and see you waving at them”). While we were waiting for the designated time to come, I tried taking a picture of my “Space Station crew” (a few more came after the picture below was taken). It didn't come out all that well in the darkness, but I loved seeing so many youngsters who were interested enough to join me that night. It turns out that many folks in the village heard their screams from the playing field, which alerted them that the special event I had earlier described to them was now taking place. Although it hurt my ears at the time, I enjoyed hearing their enthusiastic cheering as it flew overhead (the next day, one of the villagers who lives on top of the mountain asked me about all the screaming they had heard last night—apparently our screams reached clear to the top of the village!). It was good to capture their imaginations about the vastness of space, and the universe beyond the confines of our little village. Hopefully we can do this again someday, but eventually the novelty will wear off. The first time is usually the best time, and that night was a wonderful experience! David Kurtz retired at the end of May, after 30 years as a federal employee. Ten days later, he started his journey with the Peace Corps. 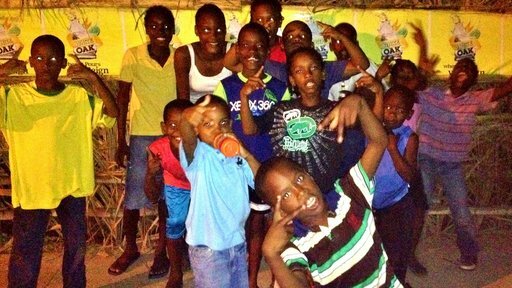 He thinks that serving as a literacy co-teacher with the Peace Corps in the Eastern Caribbean is the perfect way to transition from a long career.